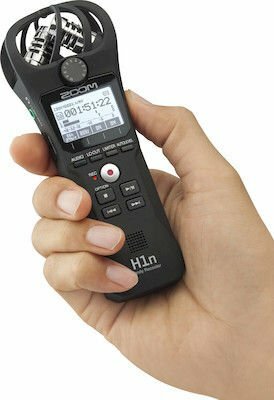 The Zoom H1n's dead-simple stereo pickup with unlimited overdubs makes archiving music performances, dialogue, and sound for film easier than ever. The H1n is the successor to the acclaimed H1. Upgraded features include dedicated one-touch buttons for recording, playback, and audio settings; a new 1.25" backlit LCD that reads easily in any lighting condition; slate and test tone generators for simpler A/V sync; auto-record and self-timer functions; a front-facing speaker; and adjustable playback speed for transcription and notation. Whether you use the phase-coherent onboard stereo XY mics or plug in your own sound source via the 1/8" stereo mic/line jack, the Zoom H1n captures your world in glorious 24/96 hi-fi. The new 1.25" monochromatic display looks great in virtually all lighting conditions. The layout is clean and organized, and the backlight pops in the dark or direct light. Auto-Level and onboard limiting provide up to 120 dB of distortion-free audio — more than enough headroom to reproduce the most dynamic spoken and musical performances. Zoom even lets you overdub audio onto your existing recordings. 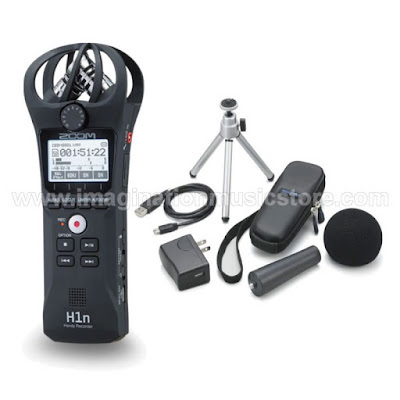 This makes the H1n an essential tool for the touring artist or songwriter on the move. The H1n is even easier to use than previous iterations. Slate and test tone generators enable picture-perfect audio and video sync, while auto-record and self-timer features make sure you never miss the moment. 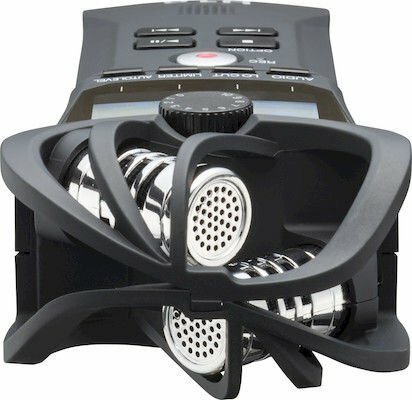 A pair of built-in stereo condenser microphones oriented in a fixed 90° XY pattern captures audio in perfect phase-coherent stereo. But when the occasion demands, an 1/8" mic/line input lets you use your studio and shotgun mics. Broadcast-ready, BWF-compliant 24/96 WAV and space-saving MP3 audio formats are available to suit your needs. The H1n promises up to 10 hours of operation using just 2 AAA alkaline batteries. Rechargeable Li-ion and NiMH AAA batteries may promise even better performance. Or, for home use, simply run the Zoom off of USB power (cable and adapter not included). Connect the H1n to your device via USB to use it as an audio interface, or to drag files to your workstation. Whether you record at home or on location, the Zoom H1n from Sweetwater captures clean audio without fuss.